Last Monday I posted about a paper mache tray I was working on without having actually finished the project. I was a little nervous that it would not turn out how I hoped, but all my nerves were calmed when I finished the last coat of lacquer and was left with a beautiful tray for my nightstand. 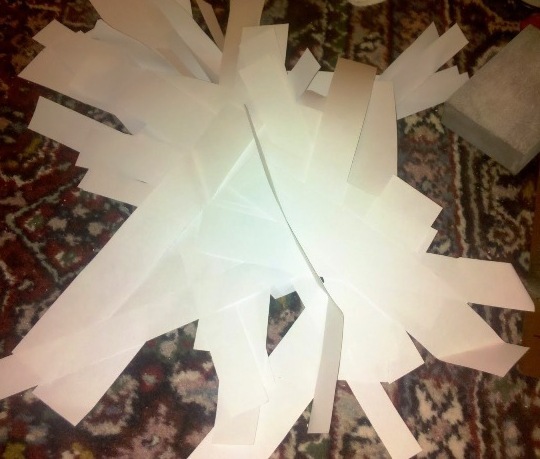 a pile of scrap computer paper cut up in strips, ready to get my paper mache on. The outside of the tray got a coat (or 5) of light turquoise paint. After letting the whole thing dry for 24 hours, it got a few coats of my favorite Rustoleum Clear Lacquer spray paint. After waiting for it to dry again, it was ready to use! You really can turn trash into treasure with a little creativity, some glue & paint, and of course time. This was such a fun project I'm wondering what else I can make with some strips of scrap paper. how about a cup or a bowl? would you ever consider something like this in a tutorial video or a giveaway? i love it....and feel inspired to make something....with papier mache. It's soooo pretty! I would love a tutorial!! I'm dying for a good craft! Beautiful! Oh I love this idea! BTW, I those same tortoiseshell bangles. Lindsey! Your little tray looks so expensive! What a great project! Perfection on the color choice. That is AWESOME! Love the turquoise and gold! you are awesome. seriously, SO cute. i may need to try this for my new bedside table!! It looks so great. I'm amazed! I love this idea, thank you so much for sharing, I have been dying for the perfect little (& inexpensive) nightstand tray, cant wait to try this! WOW! That's amazing. I love the colors you chose. It looks like your hard work (and time) were rewarded! so cute! i love the color combination. how did you get it so smooth? It turned out great! I love the gold/turquoise combo. holy smokes! this looks incredible! Very Chic! love the gold! This one looks veery cute. You turned those scraps of paper into that tray? Impressive. I think I would need a little more than a tutorial...maybe someone to do it with me? Lovely. The color combo is awesome!!! Love it! Love the metallic you went with -- it came out great! brilliant! and i'm totally stealing your idea. HA! Love your tortoise bracelets, I have some too! Great DIY; you're blowing me away with your tray skills! wow! that turned out beautifully! I think you should sell them on etsy! love the gold interior! GORGEOUS!!! I can't believe how pretty it is :) Way to go!! You just may be the queen of trays! Yes, yes, YES! I think a full tutorial is in store - I. LOVE. IT!! It's absolutely gorgeous and looks very expensive! Thank you for the inspiration. Love the color combination too! So! Are they in the etsy shop yet?!?! :) I could start my christmas shopping!!! Wow, this turned out beautifully. It's like art class for adults. Added bonus, you used recycled paper! Good for you! I just went back to the original post and saw this used to be a takeout tray! Now, I'm REALLY impressed. Who would've thought it would looks so good! I looove how this turned out!! Gorgeous! Would you believe it if I told you I have those exact same bracelets and lip salve. Identical! Ive already told you I loved this project but just wanted to drop by to tell you I featured it on my blog today. Thanks again for genius idea. Great tray but I would have liked to see the steps you went through to form it. Very pretty! I have wanted to take a class at PaperSource that does this to make little bowls- but it looks like I could figure it out based on the steps you have shown - awesome! Could you please post a list of the items you used to make it? Brand names and all. I am a non-crafty person but I'd love to attempt this, if I could find the right products. Sooo cute and ingenius!!! (found you via Adventures in Renovating a Brooklynn Limestone). you are so bloody brilliant! i've never thought a school project could produce something that looks like that. amazing! and i love the aqua and gold. looks so luxurious! i hope you don't mind me putting on my blog/ inspiration board. give me a shout if you want me to remove ya. Oh, thank you for planning a tutorial! I will totally make some of these...amazing color choices !! Love it! You are brilliant... the colors are perfect. love this and LOVE the gold & turquoise. Do you mind telling me how you got the edges so perfectly straight and the same height? Also, what gold paint did you use? Wow! How chic! Love the gold! It really looks expensive! The perfect un-crafty craft! Love this idea! Did you spray paint it? Where did you find that light turquoise paint? it's gorgeous! Just found your blog and I love it! Did you spray paint the tray? Where did you find that great light turquoise paint? It's beautiful! and just the color I'm looking for.